I long while ago I received a Fabulous Blog award from Zooarchaeologist at http://www.beingamummy.co.uk/. At the time I didn't pass it on because I was new to blogging and hadn't really found my feet or discovered enough blogs that I was really enjoying. Beingamummy was the first blog I ever read, long before I started to blog myself and it has never failed to make me smile. It remains the first feed I click on whenever I logon, having a magnetic pull that screams out 'read me now.' Do check it out. I'm telling you this because Coding Mamma over at http://www.wahm-bam.blogspot.com/ (a humorous and insightful blog about parenting) recently gave me another award called the Lovely Blog Award and this time it I will pass it on. I would have liked to pass on the nice little picture that always accompanies these awards but somehow when I tried to copy it over I copied almost the whole of Coding Mamma's blog. I'm pretty sure that that would have counted as plagerism so no picture I'm afraid. 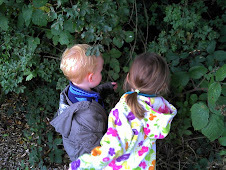 1. http://www.fourgreenacres.co.uk/ This is a lovely blog about gardening with children which always has a bit of humour. 4. http://www.mytinyplot.co.uk/ For anyone serious about gardening this has some great tips and I often use it as an easy read guide to how I should be doing things. 5. http://www.tinyartdirector.blogspot.com/ I was introduced to this one very recently and it really made me laugh. Do take a look. 6. http://www.fennelandfern.co.uk/ A lovely gardening blog which I visit for the photos. 1.People talking on their mobile phones while they are being served in shops. 2. People who use their toes to pick things up. It makes my toes curl. 3. Slugs and wasps. Really, what is the point of them? 4. People who do not know how to, or cannot be bothered to indicate at roundabouts. 5. Escalators. This is more of a totally irrational fear than a pet hate but I dislike them all the same. Thankyou GardenMom, what a lovely surprise. Will look at passing on awards to blogs I like soon. Don't you just love tinyartdirector! Makes me smile. I agree! And some great blogs I have never read before, so thank you. I am worried, though about my tiny plot - make sure you don't take all her advice blithely. She hasn;t been gardening for very long, and has made some bad mistakes in some of the advice she gives, paricularly with regard to pricking out tomato seedlings, when she showed a photo of her gripping the poor little plant by the stem! Good photos, and whoever designed her garden has done a good job. But I always feel compelled to warn people that anyone can write a garden blog...it just doesn;t mean everything they say is right! Oh, thank you so much! I do so love following your adventures with your tots, so it is a big honor to get this notice from you. I hope you have a lovely day in the garden! oh! thank you so muc!! I am sorry this took a bit for me to find - but I was so pleasantly surprised. Thank you again. Hello I just read your comment on my posting for Fennel and Fern. You may like to visit my own blog too. I also have a website directed at school gardening that may have some ideas for things to do on the plot with your little ones - although they may need to grow a little first!